How can agriculture contribute more to improving nutrition in countries like Pakistan (as well as others in South Asia) where the sector continues to employ a large proportion of the workforce, even while its contribution to national income undergoes decline? To find answers to this question is the main objective of the Research Programme Consortium Leveraging Agriculture for Nutrition in South Asia (LANSA). The latest IDS Bulletin which focuses on nutrition in Pakistan provided the perfect opportunity of showcasing emerging LANSA work on the country. The evidence paper on Pakistan which I co-authored with my colleague Mysbah Balagamwala at the Collective for Social Science Research reviews existing evidence on the pathways and disconnects between agriculture and nutrition using a framework developed for India by the research programme TANDI (Tackling the Agriculture-Nutrition Disconnect in India). A piece written on the article in the IDS Bulletin can be found here​. State fragility is a widely used term for referring to situations where political priorities are skewed against welfare and where the government’s organizational capacity is compromised. There are two interconnected aspects of fragility which influence nutritional outcomes. Environmental fragility – or the prevalence of environmental risks – is associated with food insecurity and the danger of hunger. The scarcity and volatility of water resources resulting in droughts or floods has been a frequent source of livelihood failures in Pakistan. Institutional fragility – or the proneness of institutions to fail – can trigger or exacerbate the effects of environmental fragility. As Amartya Sen showed more than three decades ago, if markets and/or public distribution of food fail due to poor infrastructure or conflict, supply side shocks can escalate into shortages, hunger and worse. Beyond food scarcity and hunger, institutional fragility is also inversely correlated with other determinants of nutrition, such as health provision, care practices, and water and sanitation infrastructure. Fragility, therefore, in both its dimensions as well as in interactions between these dimensions, can be an important determinant of nutrition. We hope to incorporate this insight into our research for LANSA by paying attention to inter-regional variations within Pakistan in environmental and institutional fragility. As it happens, many of the regions of the country which face environmental fragility also happen to be sites of conflict and state weakness. But if fragility is an important concern for understanding of nutrition, how might it be expected to influence agriculture-nutrition pathways and disconnects? Here, the story becomes somewhat complicated. 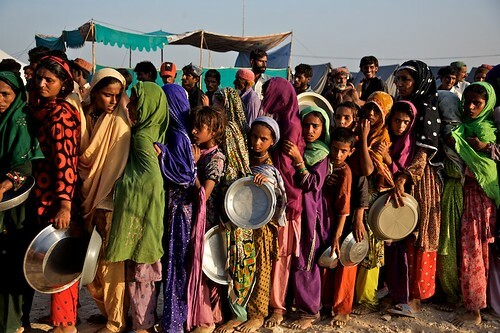 Under conditions of extreme fragility the population subsists on local food production and remains vulnerable to chronic hunger as well as adverse shocks. This means that while hunger and poverty might be widespread, the link between agriculture and nutrition is straightforward. Improvements in agricultural productivity can have direct impacts on nutrition through reduced hunger and food insecurity. As an economy develops, however, and becomes less vulnerable to environmental shock because its institutions gain resilience, the agriculture-nutrition linkage is likely to be become more complex. Livelihood and food acquisition strategies are less reliant on the local agricultural economy and markets and public action cushion adverse local food supply shocks. Policies for leveraging agriculture for nutrition will need to be attentive to prior conditions, particularly those relating to environmental and institutional fragility, in order to come up with appropriate interventions. While improvements in productivity through technological advances and other incentives will be important in fragile regions, hunger and undernutrition still remain significant concerns in regions which are environmentally and institutionally less fragile. In these relatively more developed regions the agriculture-nutrition link will need to be leveraged through more complex routes such as targeted programmes for particular population segments such as landless households and women agricultural labourers. Hunger and food insecurity in these regions is more likely to be seasonal phenomenon, particularly for the landless, thus requiring interventions which can help consumption smoothing. In some instances improving the agriculture-nutrition link may be a matter of counteracting some of the adverse impacts of agricultural growth and employment on nutrition. Non-food determinants of undernutrition are also likely to be more prominent in the more developed areas where chronic hunger is less of a problem. This blog originally appeared on SecureNutrition in July 2013. Haris Gazdar is a Senior Researcher and Director at the Collective for Social Science Research, he is also the Lead Researcher for LANSA in Pakistan.